Enjoy my twists on some classic dishes this week, such as a flavorful turkey meatloaf and quick-and-easy homemade tomato soup. 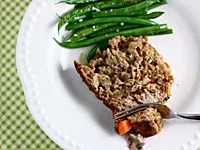 Kids will never guess the secret ingredient in the meatloaf: lentils! They give it a wonderful texture and add a nutritional punch as well. Tomato soup fills lunchtime thermoses for meals on the go. And sneak in some greens with a surprisingly delicious kale salad that will convert any and every veggie hater! A comforting favorite that uses fiber-packed lentils as the secret ingredient! Heat olive oil in a large skillet over medium-high heat. Add diced onions and sauté for about 6 minutes, until soft and translucent. Mix in the carrot and garlic and cook for 3 minutes. Add chopped mushrooms and cook for another 5 minutes, or until the mushrooms have turned soft and all the veggies are nice and juicy. Remove from heat and transfer to a large bowl. Add lentils, salt, pepper, Worcestershire sauce, and ketchup, and mix well. In a small bowl, combine milk and panko bread crumbs. Let sit for 3 minutes so the bread crumbs can absorb a little of the milk. Add to veggie mixture. Add ground turkey and beaten egg and mix well. It's easiest here to use your hands. Transfer to a greased loaf pan and press down to smooth top. Combine ingredients for the glaze and pour over top of meatloaf. Spread with a spoon to cover the surface. Bake for 55 minutes or until a meat thermometer reads 170º. A quick homemade version of the classic! One taste of this and you'll never go back to canned soup again. Heat butter in a Dutch oven over medium-high heat. Add onions and sauté for about 5 minutes, until soft. Sprinkle flour over the onions and toss well to combine. Cook for an additional 3 minutes, stirring often. Mix baking soda, salt, and sugar with diced tomatoes and set aside. Add milk to Dutch oven and whisk together, then mix in tomato mixture and bring to a simmer, cooking for about 4 minutes (the soup will thicken up a little bit while cooking). 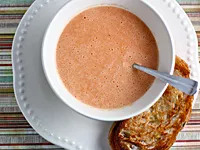 Carefully pour the soup into a blender and process for 10 seconds, until everything is smooth. Return soup to pot and keep on low heat while you make the sandwiches. Heat butter in a cast-iron skillet set on medium heat. Once the butter has melted and is sizzling, add four slices of bread and top with cheese. Place the other four slices on top and set a heavy pan over the sandwiches to press down while they cook. Flip after 2 minutes and press again with heavy pan. Serve sandwiches dunked in soup and enjoy! Quick, easy, and oh, so healthy! 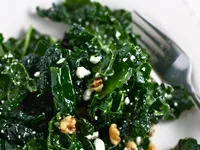 In a large bowl, combine kale, salt, shallot, and olive oil. Toss well. Add feta and walnuts. Serve immediately. It can keep for up to 5 days in the fridge.